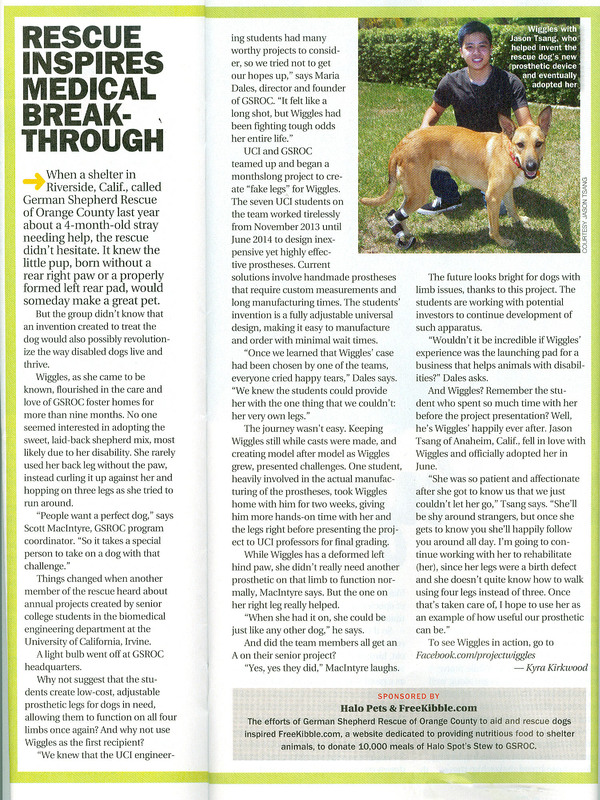 Our recently completed collaboration with a team of senior bio-engineering students from the University of California, Irvine to design a prosthetic device for Wiggles has been published in the November 2014 issue of the nationally distributed Dog Fancy magazine. In addition to being a successful project for Wiggles and the students it has resulted in a donation of 10,000 meals from the FreeKibble.com organization dedicated to providing nutritious food to shelter animals. Please take a moment to read the wonderful article about Wiggles and the UCI and GSROC team. 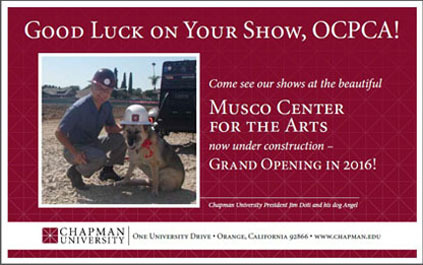 ANGEL - A former foster of one of our wonderful volunteers adopted by Chapman University president Jim Doti lends a paw in the groundbreaking ceremony for the new "MUSCO Center for the Arts" building. Angel looks forward to "shepherding" the project through its completion in 2016. April 22, 2013 On Monday evening, a young German shepherd puppy died from a bullet wound to her head. The puppy, dubbed "Tonya," by the German Shepherd Rescue of Orange County, was dumped in a night drop box at the Riverside, Calif., Animal Shelter over the weekend. Whoever left her there, did so knowing that the ten-week-old puppy had been attacked, and that she had a bullet in her skull. 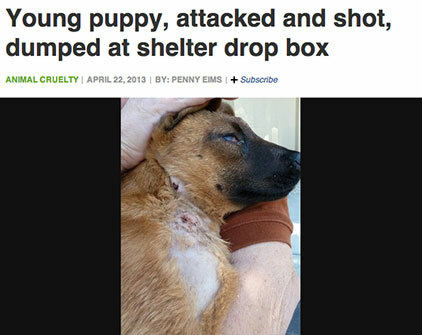 The shelter staff discovered the critically injured puppy and called the rescue agency for help. 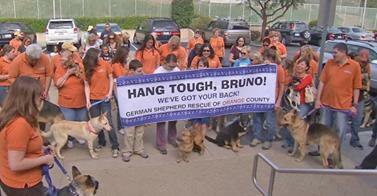 Representatives from the rescue organization sprang into action, rushing Tonya to the Yorba Regional Animal Hospital. Despite the veterinarians' best efforts, Tonya was too gravely wounded to save. The bullet was lodged behind her eye and she was too weak to undergo surgery. According to the veterinary staff, the bullet had impacted her brain function, and the only humane thing to do was to let her go peacefully. The grief-stricken rescue organization updated their Facebook fans on Monday night with the devastating news: We are so sorry she could not be saved - but she died surrounded by love and people who wanted the best for her. A representative with the rescue agency has stated that the shelter has been asked to review their surveillance tapes to see if there are clues as to who is behind this heinous act of cruelty.